Church Street, Twickenham020 8831 6396work Film/TV LocationChurch Street took its name from St Mary’s Church over 500 years ago and was the main street linking travellers between Richmond and the West. When Richmond Bridge was built in 1777, York Street became the main through route. Church Street, however, still remains a perfect street for shopping in the many unique shops and eating out. It is also a popular location for film makers. Sky Sports filmed their Christmas adverts in Church Street with Santa and his reindeer sledging down the street. A film about a young teenage girl who keeps a diary about the ups and downs of her life. Church Street took its name from St Mary’s Church over 500 years ago and was the main street linking travellers between Richmond and the West. When Richmond Bridge was built in 1777, York Street became the main through route. Church Street, however, still remains a perfect street for shopping in the many unique shops and eating out. 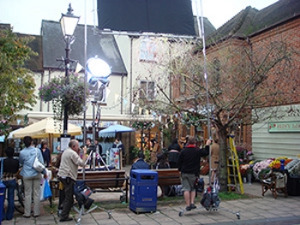 It is also a popular location for film makers. Scenes filmed at Pincho’s Restaurant and square, a perfect location to double for a road in Eastbourne, a seaside town!